Anyone else’s kids enjoy decorating Easter eggs as much as mine do? Not only do mine enjoy decorating their eggs, but they all want to eat the hard-boiled eggs on Easter and the next few days. Making painted Easter eggs is a great way to get creative with decorating eggs, but keep the mess slightly less than dyeing eggs. Another problem we have run into is trying to dye brown eggs. When we’ve had chickens, our eggs were shades of brown and green/blue. They were beautiful eggs, but hard to dye. So painting them in an excellent solution to this. Didn’t these eggs turn out fantastic? They are so cute being painted and the original shell color shows through and enhances the decoration. 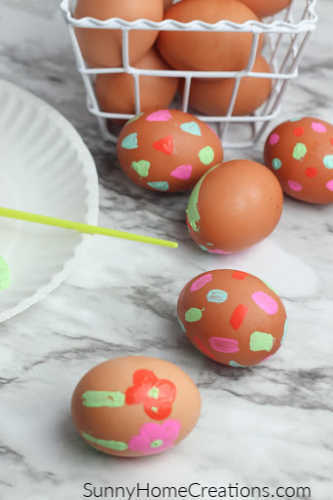 Even really little kids can paint these and it isn’t like they are going to drop the egg in the cup of dye, splashing dye all over everything. Use a paper plate or a paint palette to add the acrylic paint onto. Next, you get to paint the eggs! Make sure you only paint one side at a time so the paint doesn’t end up smudge and everyone’s precious designs don’t get ruined. 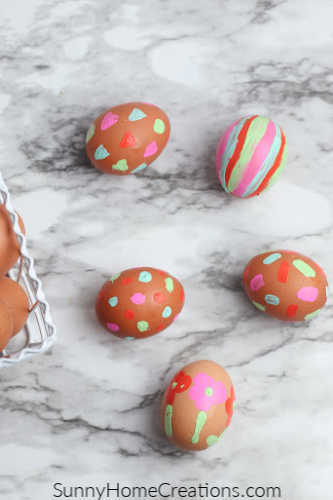 So, use the paint brush and paint some designs on one side of the eggs. Some simple ideas to paint are polka dots, stripes, shapes or even simple flowers. 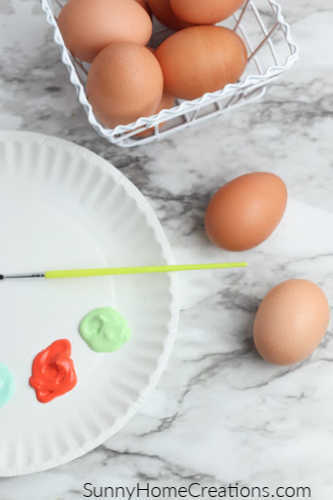 After the paint has dried, you’ll want to flip the eggs over and continue painting on the opposite side. 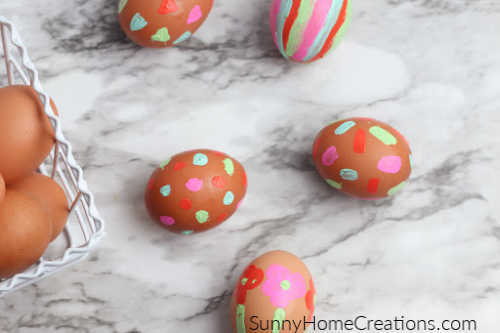 Super simple way to decorate those Easter eggs and they look beautiful and unique when you are done!